What Is the Healthy Ketogenic Diet? The Healthy Ketogenic Diet is a very low-carbohydrate way of eating that delivers moderate amounts of high-quality dietary protein and high amounts of anti-inflammatory, healthy plant based fats, and eliminates unhealthy inflammatory fats such as cheese, bacon, pork and ice cream. When following the Healthy Ketogenic Diet, your brain, as well as other organs, depends on ketones as an energy source. Ketones are produced in the body once you have reached a state of ketosis and can be measured in the blood and urine to ensure that you stay in ketosis during the keto diet. What Does the Healthy Ketogenic Diet Look Like? 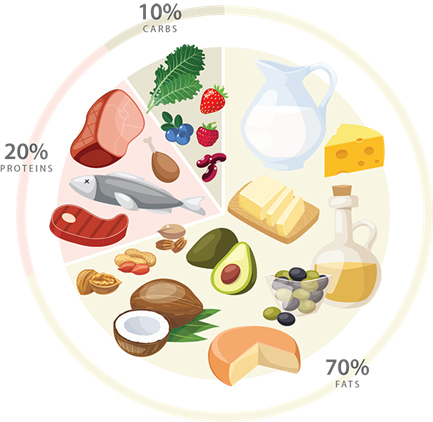 The Healthy Ketogenic Diet is comprised of approximately 10% of daily calories coming from healthy, low-glycemic, low sugar/low starch carbohydrates such as leafy greens, non-starchy vegetables, and limited amounts of legumes and berries; 20% of daily calories coming from proteins such as wild caught omega-3-rich fish, and organic, grass-fed, free range animal protein; and ~70% of daily calories coming from high-quality, anti-inflammatory, healthy plant based fats such as avocado, unsaturated and medium-chain triglyceride oils, nuts and seeds, and coconut, and eliminates unhealthy, inflammatory fats such as cheese, bacon, pork and ice cream. This 10/20/70 ratio is a guideline for the macronutrient distribution for a given day, including meals, snacks, and beverages. Dr. Helene Pulnik ND may recommend a slightly modified ratio based on your physical activity personal health and weight loss goals. Professional guidance is important in deciding whether or not the ketogenic diet is the right path based on your health history and goals, and it’s also necessary to routinely monitor ketone levels in the body while on the diet. Dr. Helene Pulnik ND offers a number of resources to help support you on your ketogenic journey along with several convenient ketogenic supplementation options to help bring convenience and variety to ketogenic living. The Healthy Ketogenic Diet may not be the right choice for everyone, depending on your personal medical history and current health conditions. Dr. Helene Pulnik ND offers a free 10 minute phone consultation to determine if the Healthy Ketogenic Diet is safe for you to follow. Please call Dr. Helene Pulnik ND at 949-416-4670 to schedule your Free 10 Min. Phone Consultation.